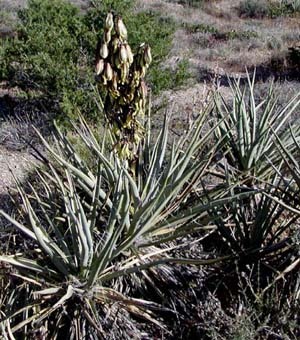 Native to southwestern U.S., nothwestern Mexico. Leaves are blue-green in color and sharp-tipped. Foliage clump may have no stem or several short, prostate ones. Bloom stalks in summer with white to creamy bell-shaped flowers rise vertically, barely above the leaf rosette. Fruits are fleshy, sweet, cylindrical, 6" long and edible. Slow growth rate.